This is the home page for the research group of Professor Mike Steel in the Department of Physics & Astronomy. Our group investigates the theory and modelling of quantum integrated circuits, time-reversed and non-reciprocal waveguides, slow light and nanocavities, and laser-written waveguides. We work as part of the ARC Centre of Excellence for Ultrahigh bandwidth Devices for Optical Systems (CUDOS) within the MQ Photonics Research Centre in the Dept of Physics and Astronomy at Macquarie University in Sydney, Australia. Much of this work takes place as part of the Australian Research Council's Centre of Excellence for Ultrahigh bandwidth Devices for Optical Systems (CUDOS), a 7 year program between 7 universities with federal funding of over $23M. Macquarie contributes three chief investigators to this major Australian effort in photonics: Professors Mick Withford, Judith Dawes and myself. October 2015: A new successful ARC grant! We've just been awarded $550,000 by the Australian Research Council to investigate Stimulated Brillouin Scattering in semiconductors. This is a project joining researchers at the University of Sydney (Prof. Ben Eggleton), the University of Technology, Sydney (A/Prof. Chris Poulton), and Southampton University in the UK (Profs. Graham Reed and Anna Peacock), that aims to enable practical devices for on-chip microwave processing (radar, wireless communications, etc) by exploiting nonlinear interactions between sound and light. There will be postdocs and PhD positions available in 2016, so contact us if have interests in this space. 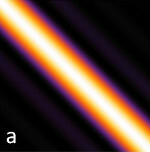 We have a new review paper on the application of femtosecond laser written waveguides to quantum optics just out in Laser and Photonics Reviews. This article (lead authors Thomas Meany (formerly of Macquarie University) and Markus Gräfe) is a collaboration between the CUDOS team at Macquarie and the group of Alexander Szameit at Jena. We cover the use of laser-written circuits for quantum interferometry, quantum gates, non-classical light sources and entanglement generation. Please take a look! 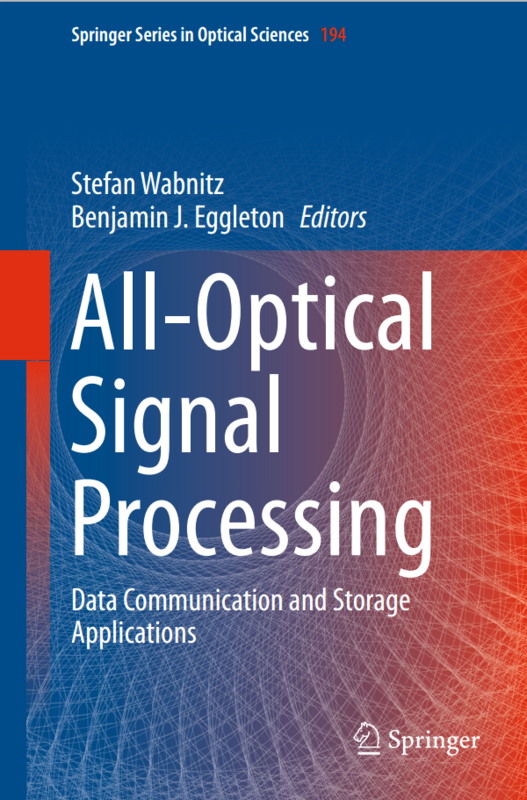 Our new book chapter on Nonlinear Optics for Photonic Quantum Networks is out in Springer in the book All-Optical Signal Processing edited by Stefan Wabnitz and Ben Eggleton. This chapter summarises the start of the art in a number of areas of integrated quantum photonics including single photon generation by nonlinear optics and frequency conversion of optical quantum states. Congratulations to all the authors! Congratulations to Dr Qiang (Jocelyn) Liu on the award of a PhD for her research in Faraday rotation in laser written waveguides. Her new paper on this work is just out in Optics Express. Jocelyn's project explored the challenges in developing optical isolators in glass waveguides. She also achieved some of the nicest theory-experiment agreement you're likely to see in an optics experiment! 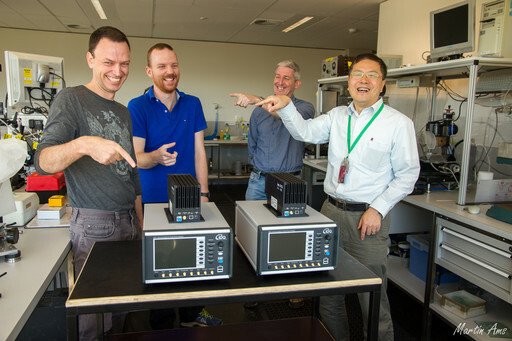 Here's some of the quantum team (Mike, Luke Helt, Mick Withford and Zhizhong Yan) with our new suite of idQuantique single photon detectors. We now have in-house 1550 nm single photon detection! If you were doing a PhD with us, you'd get to play with them! 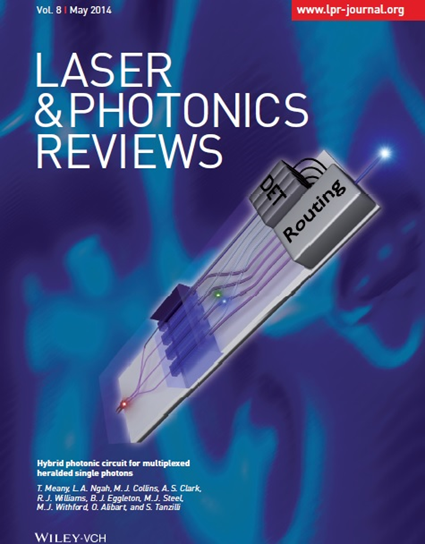 April 2014: We scored the back page of Laser and Photonics Reviews! Great work Tom Meany and the whole team at Macquarie, University of Sydney and Universite Sofia d'Antipolis in Nice, France. We are always looking for talented enthusiastic PhD students. We are seeking outstanding candidates to perform theoretical and/or experimental research in quantum integrated photonics and integrated nonlinear optics. Interested? The Contact page contains instructions on what information to send me to initiate a discussion. You can see some details about available projects on the Opportunities page. Are you an expert in nonlinear optics or phononic/photonic devices? We have a new postdoctoral research fellowship available to work on the theory of the fascinating topic of nonlinear light-sound interactions in nanoscale waveguides, especially semiconductor waveguides. Click here for details on the position and to apply. Applications close July 31 2016. Here's a new piece of work that straddles both areas of current interest in the group: quantum nonlinear optics and opto-acoustics. In a new arxiv paper with long time collaborator John Sipe at the University of Toronto, we take another look at the derivation of equations of motion for the opto-acoustic interaction behind stimulated Brillouin scattering in waveguides. We attack the problem with the techniques of guided wave nonlinear quantum optics. By identifying the right Hamiltonian for the opto-acoustic coupling, the coupled mode equations fall out in a very neat fashion. This also opens the way for thinking about Brillouin interactions at the quantum-classical boundary. One of the things that makes the coupling between light and sound in waveguides complicated is the strong dissipation that phonons suffer. Most last only a few nanoseconds. In a new Scientific Reports paper (lead author Christian Wolff at UTS) we look at how the existence of phonon loss means the amplification of light by stimulate Brillouin scattering can be reduced considerably by the phonon lifetime. It's not a deal-breaker, but one needs to be aware of the issue. We have a new (very long) paper out in Physical Review A (lead author Christian Wolff at UTS) that provides a rigorous derivation of the equations of motion for stimulated Brillouin scattering (SBS) in nanoscale waveguides. SBS is the nonlinear interaction between light and high frequency phonons (sound waves) and has tremendous promise as a basis for ultracompact devices for microwave photonics, sensing and narrow linewdith chip-based lasers. 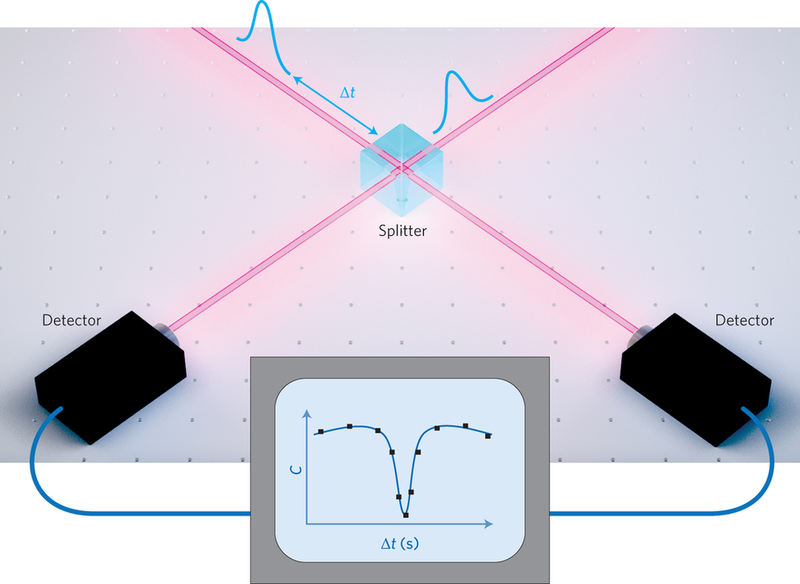 Our new review paper on femtosecond laser written waveguides for quantum optics applications (lead authors Thomas Meany and Markus Gräfe) is out in Laser and Photonics Reviews. 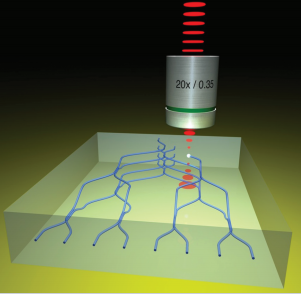 This paper is a collaboration with the group of Alexander Szameit (Instite of Applied Optics, Jena, Germany) and provides a detailed survey of the use of laser written circuits for many quantum applications, especially those exploting 3D capabilities. 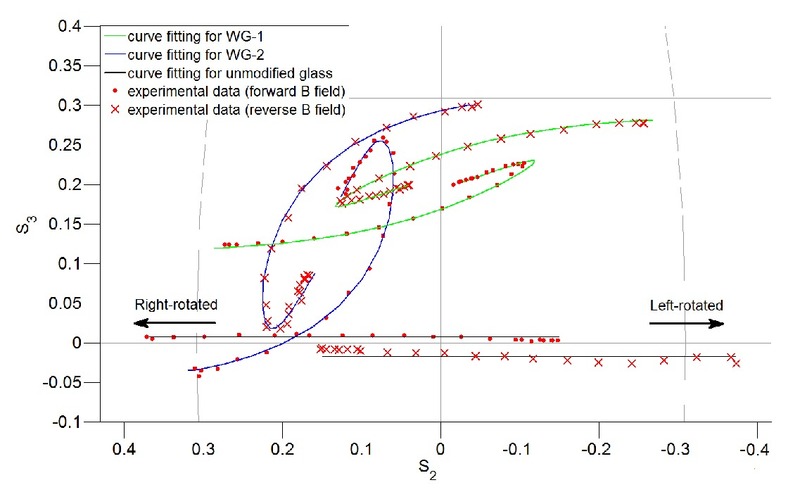 Our new paper on useful connections between quantum and classical nonlinear optical processes in waveguides and how scattering loss can affect these connections has appeared in Optics Letters (lead author Luke Helt). We have a new paper at Optics Express (lead author Christian Wolff at UTS) detailing how symmetry principles can help to accelerate the computation and design problems of nonlinear opto-acoustics (a phenomenon known as Stimulated Brillouin Scattering). Our new paper (lead author Qiang (Jocelyn) Liu) on Faraday rotation in femtosecond laser written waveguides is out in Optics Express. Jocelyn's work explores the challenges in developing optical isolators in glass waveguides. She also achieved some of the nicest theory-experiment agreement you're likely to see in an optics experiment! Former student Dr Thomas Meany wins Maquarie's Research Award! 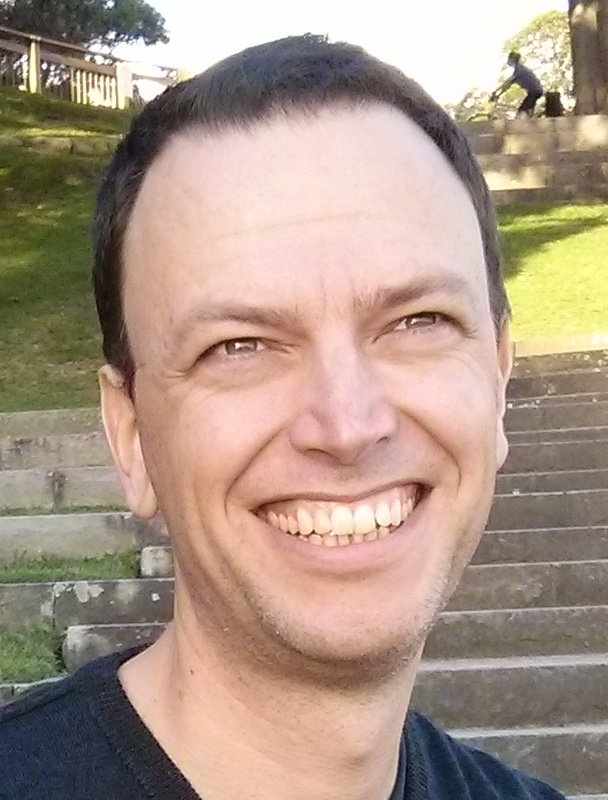 We are very pleased that our former student Dr Thomas Meany (now at Toshiba Labs, UK) has won the Macquarie University Research Award for Excellence in Higher Degree Research. Congratulations Tom. Perhaps this could be you in a few years if you undertake a PhD with us?! Our new manuscript (lead author PhD student Zachary Chaboyer) on demonstrating tunable quantum interference in a 3D 3-arm Mach-Zehnder interferometer is up on the arXiv. We show that our laser written structure should be able to significantly improve phase estimation sensitivity in the quantum regime. Our PhD student Qiang (Jocelyn) Liu has received her PhD for her thesis work on laser-written waveguides in magneto-optical glasses. Jocelyn's work brings us closer to a dedicated optical isolator for the laser written waveguide platform. Well done! Our new manuscript (lead author Luke Helt) on the effect of loss on heralded pair generation by spontaneous parametric down-conversion is up on the arXiv. This work investigates how the loss modifies the generated biphoton state, sometimes for good! Our new theory of Stimulated Brillouin Scattering (SBS) in nanoscale waveguides (lead author Christian Wollf at UTS) is up on the arXiv. Christian has found some really neat ways of teasing out the different forces involved in modern SBS systems. We are delighted that our former PhD student Thomas Meany has taken up an exciting postdoc position at Toshiba'sCambridge Labs in the UK. Tom will be continuing his work in the area of integrated quantum photonics in new directions involving solid state single photon sources. 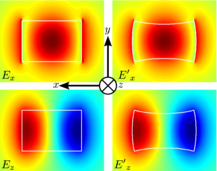 Our work on a theory of effective photons in dissipative structured materials (lead author Dr Alex Judge of Sydney University) has just appeared in the New Journal of Physics. The paper on our hybrid single photon source in Laser and Photonics Reviews has attracted a bit of media attention. Amongst others, we've been picked up by Scatterings in Optics and Photonics News and The Register, UK. Here's the original press release. I've written a commentary on recent work at Caltech that showed non-classical plasmon statistics. 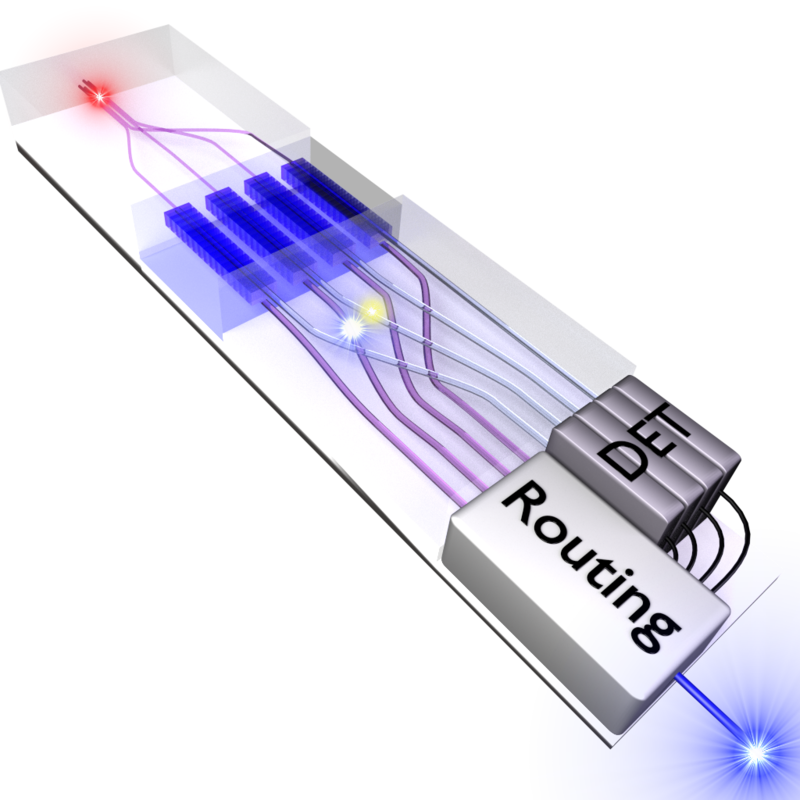 Three and four-way multiplexing in a hybrid integrated device. In a major collaboration between Macquarie, the University of Sydney and Université Nice Sophia Antipolis (lead authors, we've shown active multiplexing of three and four single photon channels in a hybrid glass/lithium niobate device. We hope this is the future of single photon sources!